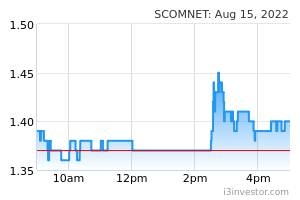 09-Jan-2019 SCOMNET - will it be THE STOCK of 2019? Supercomnet Technologies Bhd is principally involved in the manufacturing of Polyvinyl chloride (PVC) compound and cables and wires for electronic devices and data control switches. The firm’s product portfolio comprises automobile plug-in cables, copper and jumper wires, cords and cord sets, LAN cable assemblies, and a full range of computer data cables. The company’s operations are located in Malaysia. 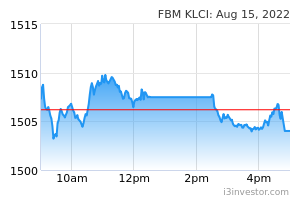 LiimInvest Got growth n profits... Management didn’t make any announcement Kah? Please ! mkmike Some good news brewing? UnicornP Dey. How could I miss this stock all the way from 40 cents to 80 cents. smallplayernia what's your verdict on the upcoming bonus issue warrant , and also the dividend proposed? Jigsaw Buy,lock it up and throw the key away! smallplayernia LOL seriously? So confident with this stock? abc123 Earnings less than 2 sen? smallplayernia fine , well written article Roger , but when is the dividend and bonus issue warrant ex date? LiimInvest keep and waiting for dividend & warrants first. Then decide. smallplayernia Liiminvest , when is warrant and dividend coming? Already break 80 cents level o , if keep waiting maybe go netherlands liao like this huhuhu. smallplayernia @liiminvest , are you worried that the PE is too high? smallplayernia @liiminvest , may i know why? what is your trading plan with Scomnet? smallplayernia @HOSELGOH , i read they say 3rd quarter of this year only gao dim and issue bonus warrant leh , very long time to wait. LiimInvest smallplayernia@ buy & hold for long term investment. Investar2862 Breakout from consolidation/sideways channel. smallplayernia Can we please have an answer for the crucial question here? Any date announced for bonus warrant and dividend? @Liiminvest , I don't dare hold long term coz of the high PE , that being said I will keep holding for now until we hear more on dividend and bonus warrant. @hoselgoh , if bonus need to wait until q3 you still dare to hold? @investar2862 , technical side yes , but sentiment so bearish i would be extra conservative with the profit target. smallplayernia @investstar2862 , not worrying , just want to know more and understand more about this trade. @huat1 , I believe bonus warrant AND DIVIDEND is the reason , coupled with strong growth and insider support of the price. That being said , you believe this stock will go beyond 1? @yu_and_mee , you don't make sense . ok if they delay the announcement to end of April and you believe price will go beyond 1 , why not reenter now? you still have 11.5 cents of profit go. LiimInvest @smallplayernia..my cost only RM0.30. smallplayernia @liiminvest , ya lo then you no need to worry , the rest of us not so lucky like you ma. LiimInvest Thanks @smallplayernia. Before I got some info too. smallplayernia @investstar2862 , lol you really think so? Don't know still can hold or not , feel like there is no more fuel for the rocket to go up like that. smallplayernia @Liiminvest , what about this time? Got info or not? TP target? smallplayernia @shinnzaii , hello hello , no la Gtronic doing well now ma , so less comment there oledi. hehe How are you?